No translation is perfect. Translating ancient and foreign languages into English is not as easy as it would seem. There are ambiguities and linguistic hurtles. Picture a sliding scale from left to right. Every translation fits somewhere along that scale. At one end of the scale are literal translations and on the other extreme are dynamic translations. 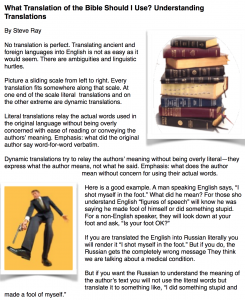 Literal translations relay the actual words used in the original language without being overly concerned with ease of reading or conveying the authors’ meaning. Emphasis: what did the original author say word-for-word verbatim. Dynamic translations try to relay the authors’ meaning without being overly literal—they express what the author means, not what he actually said. Emphasis: what does the author mean without concern for using their actual words. If you are translating the English into Russian literally you will render it “I shot myself in the foot.” But if you do, the Russian gets the completely wrong message They think we are talking about a medical condition. For my whole article, click HERE.